I guess we all had one or the other veggie in a sweet dessert. No big deal anymore. But we (or perhaps just I) thought we came to the end of the line: carrots, pumpkins, zucchini, etc. What else is there to put into a cake? SPINACH. Isn't that the craziest idea? It's not mine though, I saw it on another food blog The Chic Life. I was intrigued immediately. I made a few changes: I used mashed banana instead of applesauce, palm sugar instead of refined sugar, olive oil instead of canola and added some yogurt for moistness. The result: a perfect muffin. I PROMISE, you will not taste the spinach, it is really "just" a green banana muffin. I shared them with a friend who happened to drop by with her young kids, when I pulled the muffins fresh out of the oven. 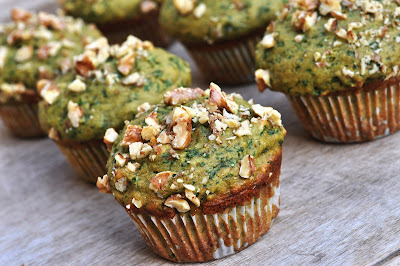 And if you want to get your kids to eat those, sell them to them as "Ben 10 muffins". That was the first association of my friend's kids when they saw them. Preheat oven to 180C (350F). Grease or line muffin tin. In another bowl, whisk together, sugar and egg until creamy. Stir in oil, yogurt, lemon zest and banana. In a food processor, blend the spinach leaves until finely chopped. Fold chopped spinach and walnuts into the batter, leaving some of the walnut aside. Fill batter into prepared muffin tin. Garnish each muffin with the remaining walnuts. Bake for 25 minutes or until toothpick comes out clean.